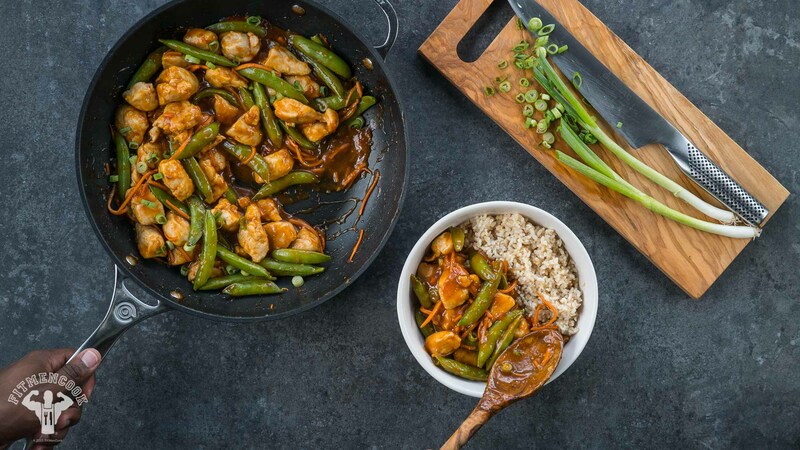 Crank the heat and flavor ALL the way up with my spicy Korean-inspired chicken stir-fry. You’ll never have to worry about #strugglechicken with this recipe since it’s pretty saucy and flavorFUL. Enjoy with cauliflower rice for a lower carbohydrate meal or some brown rice for a heartier, energy-packed meal. I got all the ingredients from my local Kroger so the products should be easy to find and are relatively affordable as well! Mix chicken and 1 tablespoon of arrowroot together in a bowl. Set aside. Mix together the ingredients for the sauce in a separate bowl. Set aside. Set a nonstick skillet on medium-high heat and spray with avocado oil once the skillet is hot. Toss in the chicken and cook for about 8 minutes until the outside is brown/seared and is no longer pink. Make a hole in the skillet and add the peas. Cook for 1 to 2 minutes until the outside edges of the peas are seared. Make another hole in the skillet and pour in the spicy sauce. Once the bubbles begin to form, reduce the heat of the skillet and continuously and quickly stir so the sauce does not clump. It will thicken quickly under the heat so continue to stir to ensure the sauce is smooth and consistent. Toss in the carrots if desired and continue to stir and remove the skillet from the heat to thicken and allow the flavors to meld together. Garnish and enjoy with brown rice, quinoa or even steamed cauliflower rice.